While fine art shipping is our major specialty, Fine Art Shippers is also proficient in shipping large and heavy items. These include pianos and grand pianos, antique and modern luxury furniture, motorbikes, cars, and certainly various types of equipment. Moreover, our experience extends to shipping heavy equipment of any kind, from street sweepers to snowcats to military engineering vehicles. What is no less important, our heavy equipment transport service is very competitively priced, which makes Fine Art Shippers a perfect choice for those looking for a professional help within a limited budget. However, the question is: do you know how heavy equipment shipping rates are calculated? In this blog post, we will tell you the basics of what you need to know. First of all, it is important to understand that shipping freight like heavy equipment across the United States is always a challenging task even for professional crating and shipping companies. Now, try to imagine how much more difficult this task becomes when it comes to its international transportation. It is no wonder that heavy equipment shipping rates may be higher than expected. If you do not know the dimensions and weight of your piece of heavy equipment, you can visit Equipment World’s Spec Guide and find there the specifications of your vehicle. This will help you get the more accurate heavy equipment shipping rates. One more thing you should know about the heavy equipment shipping rates is that they also depend on the shipping method you want to use. For example, if you are interested in transporting your vehicle overseas by containerized cargo ship or lift-on/lift-off (LoLo) ship, be ready to pay more because this method requires extra labor to prepare your shipment. 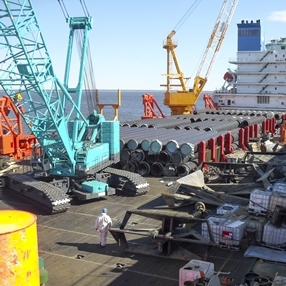 On the other hand, roll-on/roll-off (RoRo) ships offer much more affordable solutions. Anyway, a professional shipping company like Fine Art Shippers will help you choose the right transportation method in order to provide you with the best heavy equipment shipping rates possible!